DodgeIntrepid.Net Forums - Dodge Intrepid, Concorde, 300m and Eagle Vision chat > Chrysler LH Platform Forums > Chrysler Concorde, LHS, and Eagle Vision > 'no bus' issues, with headlights too! 'no bus' issues, with headlights too! Anyone else experienced his particular set of problems? From reading around here and other places on the net, could it be a TCM (or BCM) problem? Bad instrument cluster? Or something else? Might have two different problems or more. No Bus on the MIC means the Instrument cluster can't communicate with the PCI Bus and could involve a number of things. Wiring issues, Connection Issues, or a Module on the Bus bringing the entire bus down. Does the car operate normally when it happens? Accelerates/Shifts OK? Anything else stop working like A/C or Heat? Might just be a connector/corrosion problem at the back of the cluster with one or both of the connectors. You've got got an early version of Concorde gauges that can be swapped with later style gauges without modifications. Cleaning reseating might help. Not a difficult job just a little disassembly. Headlight switch communicates over the PCI Bus to the BCM which turns on the appropriate lights depending on what it sees from the headlight switch. Could be as simple as a bad headlight switch. Cheap and fairly easy to change. Without knowing more about symptoms it's a tough call to troubleshoot over the Interwebs! I've got a set of these Chrysler Concorde/LHS gauges available if you want to upgrade. No modifications needed. Haven't had time to look into it as i had to pick up another shift (12 hours) last night. The latest is now the battery is dead but I don't know if she left anything on that would have drained it. Does the BCM require programming specific to the car or can it just be swapped out? No modifications needed. for the cluster. BCM stores the mileage..most dealers won't program a used BCM. OK...still trying to get the time to work on it. Just got elected to the executive board of my local union, and that's got additional duties, plus all the year-end testing we do on our refrigeration system, plus prepping the files for next year...and the stuff at home. Eesh...oh, well, I won't be bored. OK...got some time to work on the Concorde. I'm thinking that the 'no bus' and headlight issue might be separate problems. Took out the cluster and didn't find anything, contacts looked clean, pressed all the connectors I could reach behind the fuse (junction?) box and everything on it. Unhooked the negative terminal for what seemed like over a half-hour. Ran the car but couldn't drive it since it was blocked in. No problems with the cluster dropping out though the ATC seems wonky (but then I am not sure what normal is for it - it goes into manual if I change a mode, and I suspect that's normal, but it seems weird). As for the headlights, the low beams don't come on at all when the switch is turned on, except when the relay seems to energize for a moment. The high beams come on only if you hold the switch that way. There's no "latching" that I'd expect, but then maybe there is none. When it briefly energizes I get a flash of the lights on either low or high mode, but it doesn't last. So maybe there's a loose connection or a failing part. Last edited by tropicdave173; 12-31-2017 at 02:04 PM. Headlight switches are cheap. If you have ATC with the Sun Load Sensor up near the center of the windshield, you can install an Automatic headlight switch without any modifications also. That's that red cover that appears to also have an LED in it? OK...from what I've read here, I do have the sensor. No fog lights, it being a '99 Concorde and all...but haven't had luck finding a headlight switch that has the automatic switch without the fog lights. Is this a big issue or just some unused switch contacts that won't matter anyway? I'm not against the idea of having fog lights but I also don't see where factory ones would go (it's not really an issue, anyway). So getting the switch with fog lights and automatic lights (aka Twilight Sentinel) would be the right part? And would installing it be as simple as replacing the headlight switch, or does the sun sensor wiring also need to be dealt with as well? Finally got to my favorite salvage yard and found a headlight switch out of (I think, it's been a while) 300M, and that has, I am happy to report, solved the headlight issue. The "no bus" problem is still there, but I haven't had time since that last trip to pull an instrument cluster to see if that's the problem. Ronbo, might I ask for some pics of the clusters you've got and a price? Seems easier that trying to schedule a trip to West Palm Beach. Of course, it could be the BCM. While I know (from reading here) that it's on the other side of the junction block, my major concern is what programming would or would not be required. Thoughts? 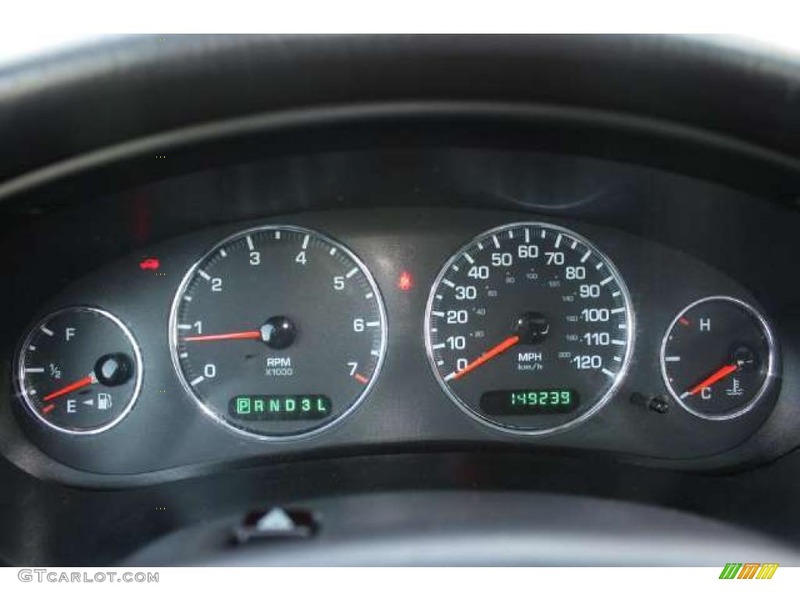 Gauges drop out, singly or sometimes all, or any combination it seems. Most common is for the fuel gauge to go first. When they all drop, the shift indicator goes out as well. The car has the ATC controls, and they go dead, and the A/C (or at least air from the blower motor) goes to the windshield defrost. I presume that's a default. Cruise seems to work but of course is not displayed. Can't think of anything else off the top of my head...the above is enough! Oh, one more thing. The car had a tendency to not want to start if it was left alone too long. That's now occurring more often. Battery, starter and alternator all read good from the unit the guys at the parts store use (whether that's correct or not...?). There’s an “IOD” (Ignition Off Discharge) of 25 to 35 mA (depending on which year FSM you read) that drains the battery in approx. 21 days according to the FSM. If your battery has more than, say, 3 or 4 years on it or has had a rough life (a few discharged from leaving lights on overnight or whatever), it could drain much sooner. How long does it need to sit before it won’t start? Also, when it is driven, how long is it driven - IOW, how much of the IOD and energy lost in starting is made up in the amount of driving that is done? Is the driving highway driving (good output from alternator), or is it in-town or otherwise low speed driving? Alternator doesn’t put out full power below 1500 to 2000 rpm, particularly with higher electrical loads on (headlights, cabin fan on higher speeds, etc.). I used to have a 1.4x2 mile daily commute, and my battery was about 3 years old (tested fine) and the alternator worked fine, and my total commute was 80% at 25 mph, and the rest was a short burst up to 35 mph. Unless I threw a charger on it periodically or did extra driving during the week, my battery would continuously get lower and lower until one morning it wouldn’t start. One thing that would help was keeping it in a lower gear on the 25 mph stretches to spin the engine and alternator a little faster. If you get one of those voltmeters that plugs into the cigarette lighter and watch the system voltage while you drive, you’d be surprised how low the alternator voltage is at lower engine speeds. The spec. in the FSM IS MINIMUM OF 13.5 volts, but only at engine speeds above 2100 (or 2200, I forget which). I got one of those cigarette lighter voltmeters, and it was very eye opening. OK, it's been a busy several months (two out of town trips, lots of union work, overtime since one of our guys went out on long-term disability though now he's been replaced, family, etc). Found a copy of my car down in a WPB salvage yard, though unfortunately the deck lid was toast - I got a dent in mine. Still closes, but doesn't want to open with the fob or switch. Least of my worries . Managed to fix a few things like the front passenger door handle, right rear latch, speakers, and whatnot. The "no bus" problem remains. Got the instrument cluster out of the base '99 to see if that was what was wrong, but it started dropping lights and gauges too. Also, seems like the lights (gear indicator, overhead console, odometer and ATC or radio, change intensity when the cluster drops in and out. Everything in post #12 is still there, though the problem of the car dying on me hasn't happened. I'm thinking of trying the BCM from the base car to see if the cluster drops out, then getting a new programmed one if that works - unless there's advice against it. I know it's like a different module with differing capabilities but would swapping them out lock up anything?